Preheat oven to 425. Melt Margarine in an oven safe glass dish. In a shallow dish, mix Bread Crumbs and crushed Corn Flakes. Now, if you're using May Wah chicken or any vegan chicken that is already formed, cover the Fake Chicken with the melted Margarine, and then coat with the Corn Flake mix. It won't really "stick," so you'll need to be careful removing them from the Corn Flake mix. (See photo below) If you're using the Match, form it into "fingers" with your hands, and then coat with the Corn Flake mix. You'll want to gently push the Match into the Corn Flake mix to get the most mix on there you can. After all your "fingers" are coated, place them in the oven safe glass dish with the Margarine. Sprinkle a handful of Corn Flake mix over the top. Then, bake for about 5-10 minutes. Flip the Fingers over and put back in the oven for another 5-10 minutes. 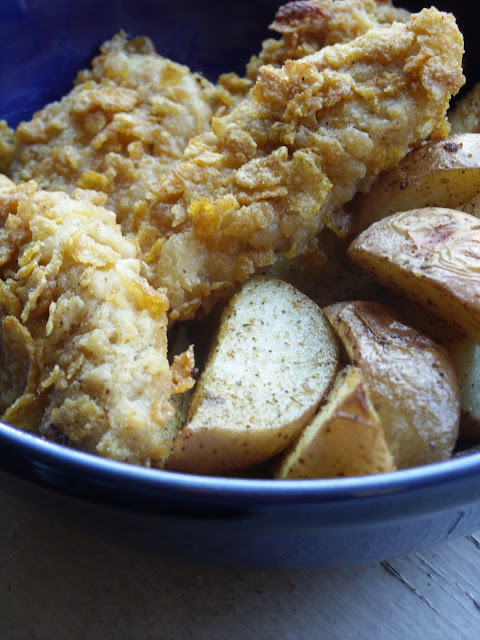 You'll want to make sure that the extra Corn Flake mix gets coated with the melted Margarine. You'll want to remove them from the oven when they're golden brown. We ate them with Betty's Oven Fried Potato Wedges. This recipe is already vegan, so we barely tampered with it. In a bowl, mix Salt, Sugar, Paprika, Mustard Seed and Garlic Powder. Place Potatoes in an ungreased oven safe glass dish with the skins down and the white part up. Spray with the Olive Oil Cooking Spray until lightly coated. Sprinkle with the Salt mix. Bake uncovered for 20-30 minutes, until the Potatoes are tender when you pierce them with a fork. You'll need to keep an eye on them since Potato sizes vary. The bigger pieces of Corn Flakes just wouldn't stick. I'm really interested in trying the "Match" stuff, I'll have to order some. Have you tried using vegan mayo (thinned with a little soymilk) to dip your chicken (or whatever) pieces in before breading them? I've had really good luck with crumbs sticking when I do that. I know it doesn't give them the same "buttery-fried" taste but at least the coating sticks... just curious. Yeah - ya know - usually we make a batter to dip things in but we went with the Betty style this time and it was super fast and easy. I was kinda shocked at how fast these things were to make. It's not fair, i want to move to America - like now! Those look scary good, Annie!!!!!!!!! !